Heat the oil in a pan. Sauté the onion, add the peas and stock, cover and simmer for approx. 5 mins. Puree the peas, season. Top with 1 tbsp of the tarragon, set the rest aside. Heat the oil in a pan, sauté the onion. Pour in the wine, add the reserved tarragon, bring the liquid to the boil. Remove the pan from the heat, season the fish, add to the liquid, cover and allow to infuse for approx. 3 mins. Remove the fish fillets from the pan, cover and keep warm. Reduce the liquid to approx. 200 ml, pour in the cream, bring to the boil, simmer for approx. 3 mins., season. Fry the bacon in a frying pan until crispy, without adding any oil. Add the icing sugar and cook briefly. 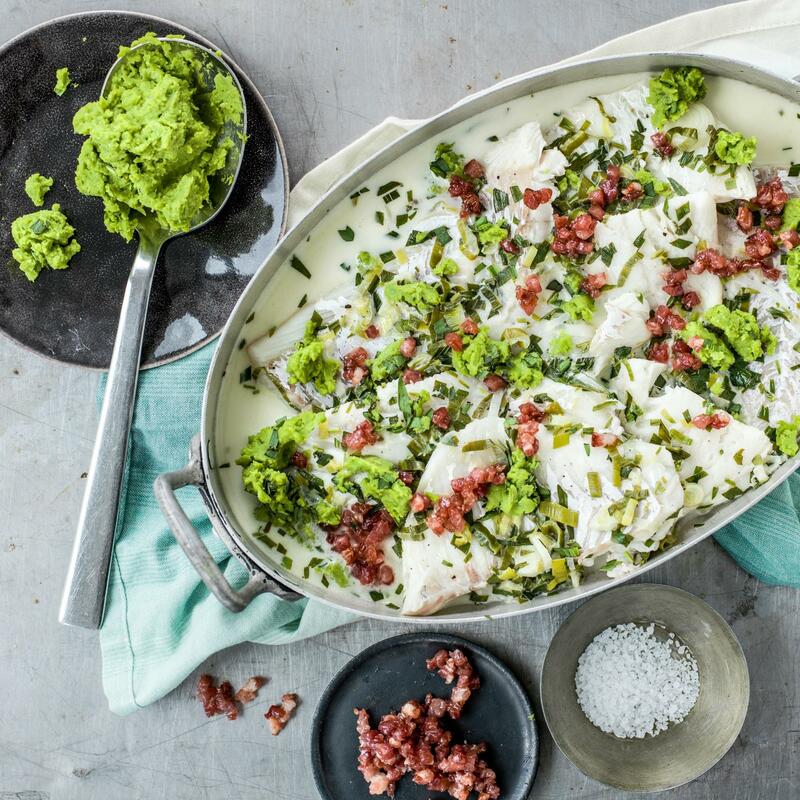 Plate up the cod fillets and pea puree, top with the bacon.